The most important date in modern Irish history, Padraig Yeates maintains in his new book, was not 1916 or 1922, but 1914 and the outbreak of the Great War. The war led the British state to make great demands on its citizens – economic hardship, rationing and ultimately conscription. In Britain these were endured, more or less, for the sake of national survival. In Dublin, Yeates shows us, they fell on a city already humming with radical nationalism, militant trade unionism and a hint of revolutionary socialism. Throw in the impact of the Easter Rising in 1916, when Dublin itself briefly became a war zone, and one can see how the war helped to sever most public affection for the British connection in the Irish capital. Padraig Yeates is a man with Dublin under his skin. Having worked as a journalist for many years in the city, covering strikes, protests, crime, the anti-drugs movement and more, his writing bursts with a feeling of place. He also has the working journalist’s head for details, facts and figures. In A City in Wartime we hear not only about the famous landmark events – the Howth gun-running, the Bachelor’s Walk shootings, the Easter Rising, but also about the plans to get rid of the city’s slums, the rates of infectious disease in the inner city, the occupations of the average tenement dweller and so on. This attention to detail uncovers some gems. Who for instance, knew that on the first anniversary of the Easter Rising, republican activists and “the Dublin mob” rioted with the police for hours, placed a tricolour on the ruins of the GPO and, as in the Rising itself, took the opportunity to loot some city centre shops? Or that the Dublin Corporation, unionist as well as nationalist councillors, voted against increasing the subsidy paid to war widows in 1918? Or that the Volunteers gained much of their mass appeal in 1917-18 by seizing and slaughtering animals set to be exported and distributing the meat among hungry Dubliners? This worm’s eye view tells us a lot about how disaffection inDublin, that would eventually end in nationalist revolution, was fed by the war. Taxes went up as did food prices. Every scrap of land was used for allotments to grow vegetables and many Dubliners routinely experienced malnutrition by the war’s end. It will some as no surprise to most readers that the British repression of the Easter Rising and the shooting of its leaders antagonised the public, but this is the first time that this reviewer has heard of the discontent caused by the Government’s generous compensation for property destroyed in the Rising but miserly payments to the relatives of those civilians killed and injured by British troops in its suppression. There is a downside to Yeate’s eye for detail though – at times it can overpower the feeling of a developing story. A City in Wartime, for this reason lacks the Russian-novel feel of Yeates’ epic Lockout on the great strike of 1913. It doesn’t help the story of course, that many of the most colourful characters – James Connolly and Thomas Ashe in particular – meet violent deaths – the former by firing squad, the latter by the latter by force feeding – before the book’s halfway point. However, as well as some fascinating anecdotes, this book has several important arguments to make about the impact of the war in Dublinand in Ireland in general. Firstly, Yeates makes short work of the argument that the war was ever popular in Dublin, in spite of John Redmond’s and the Irish Party’s call on Irish nationalists to support it. Full blooded support came only from the city’s 92,000 strong Protestant (and generally unionist) population. Initially some middle class Catholic Home Rulers also flocked to the colours – notably Redmondite stalwarts Thomas Kettle and Willie Redmond, but this enthusiasm did not outlast the first mass casualties inflicted on Irish units, at Gallipoli and ‘Mouse Trap Farm’ in France in 1915. Among the working class population, Yeates argues, who made up most recruits, recruitment was almost solely economic in motivation. A great many of those Dubliners who fought in the British Army were reservists who had to return to service when war broke out. Many others had been unemployed and some were keen to learn a trade, especially in new units like the Royal Air Corps and Royal Engineers, which was closed to them in Dublin by the city’s caste-like craft unions. By the final year of the war in 1918, the Army wanted 200,000 recruits from Ireland to plug the gaps caused by the German Spring offensive but got just 6,000 (3,000 from Dublin). In Britain, recruitment targets from 1916 were met by conscription, inIreland this was fiercely resisted and plans to do it were abandoned. In short, once the costs of war were clear, most Dubliners did not have the stomach for fighting in it. Service in the British Army was, Yeates therefore argues, not necessarily ideological. Many joined as nationalists and came back as nationalists. But another important point Yeates makes is that many never came back at all. Some 30,000 Irishmen (5,000 fromDublin) died in the Great War, but out of the remaining 170,000 who served, only 100,000 chose to return toIrelandwhen the war was over. By November 11 1918 only a minority in Dublin came out onto the streets to celebrate the Allied victory and the following day, once the ‘Sinn Feiners’, by now politically ascendant in the city, had mobilised themselves, there was vicious rioting all day between them and British troops. A second important, if somewhat implicit, theme in the book is the character of the looming nationalist revolution. What struck this reviewer was how passive a phenomenon this was for the average citizen. The hardship caused by the war and the repression of the Easter Rising moved most Dubliners to passive rejection of the IPP and and passive adoption of Sinn Fein. Dublin’s unionists might have been expected to form a radical anti-separatist block but by 1916 they were, Yeate’s reports, too middle class to fight on the streets. The city had seen militant working class unionism through much of the 19th century but there is little trace of this in 1914-18 Dublin. Protestant unionists joined the Army, collected for the war and welcomed British troops during the Easter Rising but never seem to have thought of taking on the Sinn Feiners physically. The separatists, for their part (who included quite a few Protestants) simply by-passed the unionists through strength of numbers in the election of 1918. Similarly, the Irish Parliamentary Party did not need to be beaten off the streets by the Irish Volunteers – they rather slipped further and further into unpopularity through association with the hardship caused by the war and with the repression of the 1916 rebellion. The bulk of the Dublin population initially quietly went along with the war and the Irish Party until it started to cause them economic problems and raised the possibility of being conscripted and then, just as quietly, threw in their lot with the new, post-Rising, republican Sinn Fein. The separatist activists, who marched, rioted and who had their military gesture at Easter 1916, were a minority to whom the silent mass of Dubliners eventually hitched their wagons. And the revolutionaries had little to say about Dublin’s appalling social problems. WT Cosgrave, whom we meet as a Sinn Fein city councillor, was it is true, a long time advocate of slum clearance. IRB men such as Thomas Ashe and Ernest Blythe might feel sympathy with workers’ struggles in 1913, but political power, Irish self-determination remained their only common goal. Padraig Yeates therefore has many ambivalent things to say about Dublin’s experience of the First World War. But in the end, one can sense, his sympathies lie with the ‘democratic, active citizenship’ of the Irish Volunteers, ‘infinitely more appealing’, he writes, ‘than the blind obedience and lack of respect for most things Irish that recruits experienced in the British military machine’. In conclusion, this is a well-researched and important book and will be of interest to anyone seeking to understand Dublinin the early 20th century, the impact of the Great War onIreland and why it was immediately followed by political revolution and guerrilla war. Written by: John_Dorney on 12 October, 2011.on 8 November, 2015. 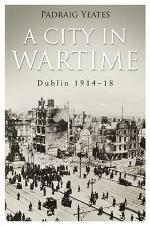 3 Responses to "Book Review: A City in Wartime, Dublin 1914-18"
What an excellent review. Makes me want to go out and buy it now but will save it for the Christmas list. In retrospect, those that stayed out of WWI chose the wisest course of action. Except, nobody will dare say it. It has become an article of faith, to ensure good standing in the Irish media, in post revisionist Ireland – to never state the completely obvious !!! !